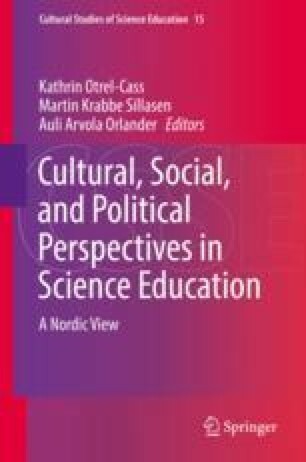 This essay uses a sociomaterialist perspective to shed new light on science education in general and scientific inquiry in particular. The focus is on human and non-human actors in science education—the pupil and the microscope. The analysis uses the concepts of figuration, apparatus and phenomenon to trace and illuminate performative figurations in science education. One of the conclusions is that the impact of events in a specific classroom extends far beyond local practices. In addition, it is shown that materialities are structuring forces, the crucial components that organize practices and produce values that in turn influence its members. In order to learn more about education, one has to step outside the immediate confines of the classroom in order to trace practices through assemblages of actors. Isling Poromaa, P. (2015). The significance of materiality in shaping institutional habitus: Exploring dynamics preceding school effects. British Journal of Sociology of Education. doi: 10.1080/01425692.2015.1093406. http://dx.doi.org/10.1080/01425692.2015.1093406. Jobér, A. (2012). Social class in science class. (Doctoral thesis). Malmö: Lund University. http://hdl.handle.net/2043/14071. Lindström, K. & Ståhl, Å. (2014). Patchworking publics-in-the-making: Design, media and public engagement. (Doctoral thesis). Malmö: Malmö University. http://dspace.mah.se/handle/2043/16093. Mol, A. (2000). Things and thinking: Some incorporations of intellectually. Quest XIV (1–2). Available at http://michiel.ipower.com/Quest_2000_PDF_articles/Quest_14_mol.pdf. Accessed 17 May 2016. Osborne, J. & Dillon, J. (2008). Science education in Europe: Critical reflections: A report to the Nuffield foundation. Available at http://www.nuffieldfoundation.org/sites/default/files/Sci_Ed_in_Europe_Report_Final.pdf. Accessed 25 Aug 2014. Rocard, M., Csermely, P., Jorde, D., Lenzen, D., Walberg-Henriksson, H. & Hemmo, V. (2007). Science education now: A renewed pedagogy for the future of Europe. Available at http://ec.europa.eu/research/sciencesociety/document_library/pdf_06/report-rocard-on-science-education_en.pdf. Accessed 27 May 2015. Serder, M. (2015). Möten med PISA: Kunskapsmätning som samspel mellan elever och provuppgifter i och om naturvetenskap. (Doctoral thesis). Malmö: Malmö University. https://dspace.mah.se/handle/2043/17966. Skolverket. (2011). Curriculum for the compulsory school, preschool class and the leisure-time centre 2011. Available at www.skolverket.se/publikationer. Accessed 16 Dec 2011.